When it comes to achieving your health and fitness goals, you can’t rely on motivation alone. Motivation will help get you started, but habits are what will keep you going! When you get tired, stressed or busy, your motivation will drop and you will struggle to stay on track with your health and fitness goals. How many times have you set yourself a goal, only to let it go when work gets busy or you feel tired or stressed at home. In comparison, if you establish new healthy habits, even when life throws you a curve ball, you will stay on track with your goals, because you will be doing things out; almost without thinking about them. This is where the the BodyBoss Ultimate Body Fitness Guide & Superfood Nutrition Guide can help. These guides have been designed to add structure to your health and fitness plans and help you form new, heathy habits in order to achieve your health and fitness goals. The BodyBoss Ultimate Fitness Guide is a structured fitness program that runs over 12-weeks. It is made up of fun, yet challenging high intensity workouts and is perfect if you are struggling to stay motivated with your training as it will provide you with the structure that you need to make working out a habit. I tested some of the workouts at home and absolutely loved them. The short, 24minute timeframe meant that I could still workout, even on my busiest of days. And the pre-planned structure meant that I didn’t need to spend time planning out my session. I also loved that workouts didn’t require equipment but were still able to get my heart rate up quickly & make me sweat within minutes. 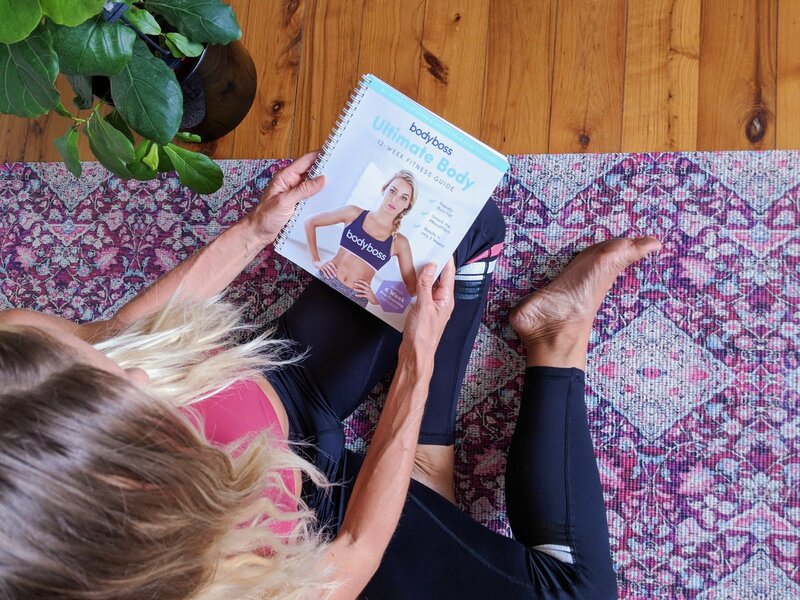 If your workouts are lacking structure & you are finding it difficult to stay motivated with your training, I recommend checking out The BodyBoss Ultimate Body Fitness Guide. Over the 12 weeks it will help you form new, healthy workout habits and allow you to stay on track and reach your fitness goals. 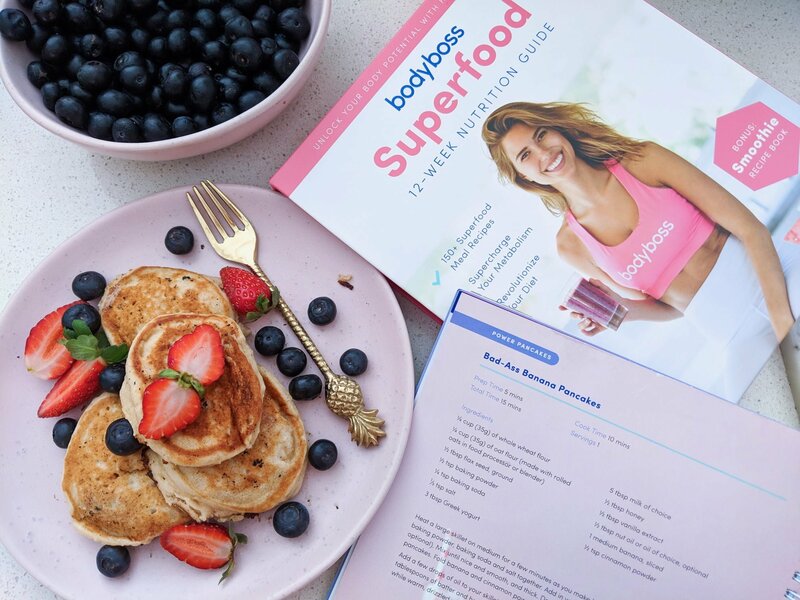 The BodyBoss Superfood Nutrition Guide is a 12-week guide that works along side The BodyBoss Ultimate Body Fitness Guide to help you form healthy habits with your eating. It focuses on nutritious, sustainable eating with a 12 week structured meal plan that includes over 150 recipes healthy, balanced recipes. The reason the Superfood Nutrition Guide can help you form healthy eating habits & achieve your goals, is that is not a crash diet or restrictive eating plan; rather it is a long-term, sustainable guide that will help you develop the skills for healthy living. The guide covers essential topics to a nutritious life including food preparation and food storage (including a “cook now & save” and “prep and assemble later”), healthy wholefood ingredient lists and comprehensive shopping lists. The meals are quick and easy to make & the guide will teach you how to replace nutrient-poor, empty calorie foods, with nutritious, healthy foods that will provide you with sustained energy for a nourished life, which is personally what I am an advocate for & the key reason why I love this guide. I have tried a number of the recipes out from the guide myself and I love the focus the guide has on balanced eating, with each recipes including a healthy source of carbs, fats and lean protein, as well as an excellent focus on vegetables. I also loved the variety with the recipes & that they were enhanced with natural flavours like spices & herbs, without the need for highly processed and packaged ingredients. My personal favourite recipes from the guide include the Berry Me in Pancakes, Blast Off Berry Oats, Gone Troppo Salmon & Salsa, Sesame Tofu Super Bowl, Green Machine Fritters, Creamy Avo Hummus & Very Veggie Burgers. 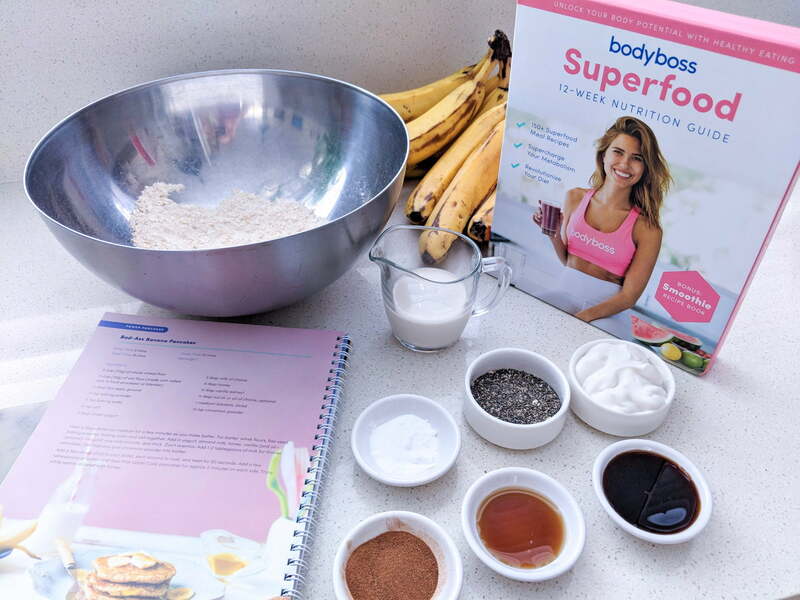 If you are struggling to form new healthy eating habits, then I would recommend checking out The BodyBoss Superfood Nutrition Guide. The 12 week meal plan is excellent for those who find meal planning time-consuming & stressful and will help you establish routine & habit with your eating. All meals are planned out and structured for you & each day includes 3 main meals (breakfast, lunch and dinner) and 2 snacks; teaching you to enjoy healthy, regular meals and to give you a balanced intake of macronutrients (carbohydrates, protein & fats) and micronutrients. 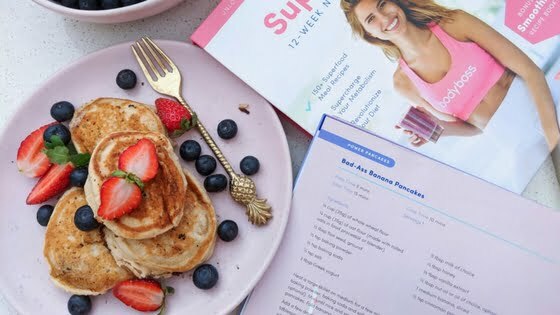 If you are wanting make healthy changes with your eating but don’t know where to start, I recommend trying The BodyBoss Superfood 12-Week Nutrition Guide! Sponsored Content: This article is proudly sponsored by BodyBoss. All opinions are my own and not influenced in any way.